Of all species of magnolias, there is perhaps none as iconic or more beloved than the Southern magnolia. Known for the delightful scent that fills the air when they bloom, these majestic evergreens are a crown jewel in our area’s landscape. Here are five reasons why you should consider planting one. They’re dramatic. The Southern magnolia stands out all year long. While there are cultivars that don’t grow as large, the Southern magnolia can reach a height of 80 feet with a span of 40 feet. An evergreen that grows in a natural pyramid shape, their leaves are a thick, large and leathery dark green, with a soft, slightly furry brown underside. Their creamy white blossoms add pops of color from late spring into summer, and come fall, become a rather unusual-looking seed cone. As the flower opens and the petals drop off, an item resembling a pineapple in the center becomes more apparent. As the summer months go by, this structure morphs into a cone-shaped seed pod. When the pod matures, bright red seeds start spilling out. High in fat, these seeds are a favorite food of birds. Dramatic in appearance, the seed pods as well as the leaves are a favorite in holiday greenery displays. 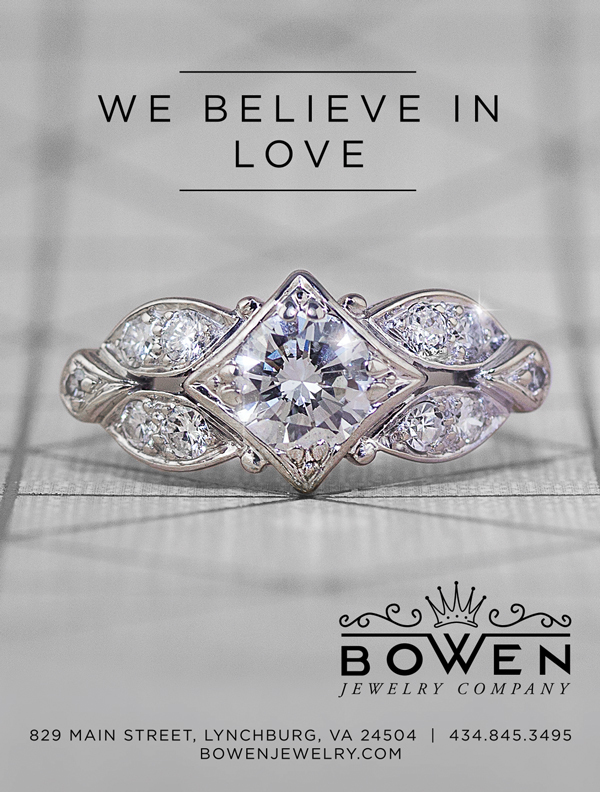 They’re resilient and rugged. According to fossil records, magnolias have been around for at least 100 million years. With over 80 known species, there are both deciduous as well as evergreen magnolia trees. They are wildly adaptive to different climates, soils and exposures, so that while native to Asia and North America, magnolias thrive in almost every region of the world. Pollinated by beetles, the leaves’ slightly leathery finish makes them more resistant to insect damage. There’s really not much they can’t withstand—their bark doesn’t burn well, protecting them from wildfires, and they can tolerate moderate droughts. They very easily live well over 100 years. They’re not at all fussy. Once planted, Southern magnolias need very little attention. They’re relatively pest free, and the problems that do pop up—like scale or leaf spots—can probably go untreated. They don’t require pruning, although they can lose limbs in ice storms. Because their leaves are so tough, they are slow to decompose when they drop. This makes it hard for any competing plants to pop up under them. They’re from around here. The Southern magnolia is native to the Southern United States, where it can be found in the wild from Virginia to South Central Florida and as far west as Oklahoma and East Texas. They are the state tree of both Mississippi and Louisiana. This means that very little effort is required to make them thrive, other than planting them. As a native to the area, they provide food and habitat for birds and other wildlife, particularly during the winter months, when their tough leaves make excellent shelter from the harsh weather. 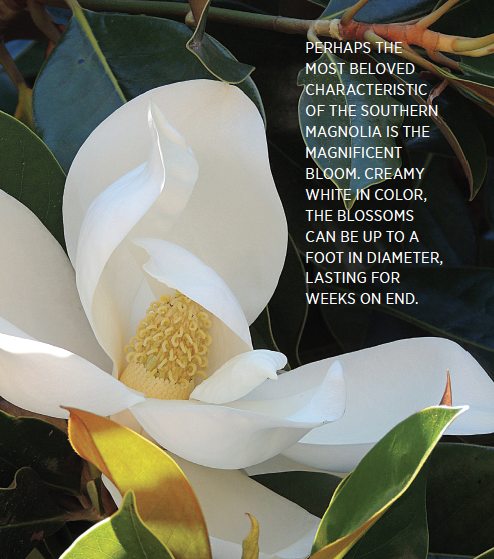 And that aroma… Perhaps the most beloved characteristic of the Southern magnolia is the magnificent bloom. Creamy white in color, the blossoms can be up to a foot in diameter, lasting for weeks on end. They open sporadically beginning in late spring, sometimes running throughout the summer. The blossoms have a distinct fragrance that has been known to perfume an entire garden—slightly sweet and reminiscent of tropical fruit, but not overpowering. There is no mistaking the scent of a magnolia in bloom. Southern magnolias prefer to be planted in early spring. They have a wide, shallow root system that needs to spread out when planted. They do best planted away from sidewalks, driveways and roads, so that their roots have this room to spread. They can take either full sun or partial shade, although the amount of light they get will determine how tight or loose their pyramid shape is. More direct sun results in a tighter pyramid, while a Southern magnolia in a shadier spot will have a looser shape. They prefer slightly acidic, moist soil, but they can adapt. They don’t need to be fertilized upon planting; you can wait until the start of the next growing season. Southern magnolia trees do best when planted among a variety of trees in rich but well-drained soils. Southern magnolias are not fast growers, with a growth rate of about a foot a year. They need little attention beyond regular watering to become established, but they can take a few years to bloom—up to five or more years. While most gardeners admit that gardening can take patience, that particular amount of time can be a bit much to ask of anyone. Thankfully, the Southern magnolia tree has so much to offer that holding out for those majestic blossoms is well worth it.